What is Good Writing? Evan S. Connell’s "Mrs. Bridge"
This semester, I signed up for a class called “Thickening the Plot,” taught by a petite funny lady with short, grey-blonde hair and round glasses. When she smiles, her eyes get small and you can see her gums, which my mother tells me is a sign of a person not to be trusted. But I think for this professor, I’ll make an exception. I heard her speak at orientation. She was one of three women who were assigned to speak to the non-fiction students, and she was the most humorous and open. She sat comfortably in her chair, leaning slightly back with her legs loosely crossed in comparison to the other two women, who were writers too, but I think less well known. They sat more primly, hands clasped in their laps and a nervous look on their faces as though they hoped they wouldn’t be called on. It’s always funny to me when professors act like elementary school students. Sometimes on campus I see a professor eating alone, or walking somewhere with their heads bent low or absorbed in something on their phones, hoping I think, not to be recognized or approached. In class, they come alive. They turn on. But this professor, of the short graying hair and the round glasses, is always on. She was not my professor then, but at orientation she strode to the podium to welcome us in a clear but slightly warbly voice, and cracked a few non-funded MFA jokes (something about Columbia being expensive, but worth it…she hopes). Those of us who were feeling awkward or on the verge of dozing off awoke, relieved to be laughing and charmed by this slight woman, dressed rather mannishly in slacks and sensible brown shoes, and whose voice and manner of speaking indicated that in fact, she had a steely writer’s core and strong opinions. I took matters into my own hands and showed up on the first day of her class along with a half dozen of other hopefuls. We crowded into the small, sparsely furnished seminar classroom, with tables arranged to sit fifteen comfortably but were now meant for twenty, and waited as she called roll of the lucky twenty students that had the good sense to sign up early. Then she turned to those of us who weren’t on the roll. I looked around the room. There were about eight of us seated alongside the walls, removed from tables which could only seat twenty. It was a fire hazard, but yes, we did fit. A week later I was on the roll, and already immersed in the reading list. The professor it turns out, is much stricter than her easy manner suggests. She dislikes it when we leave the room to use the restroom, which for me and my unfortunate pea-sized bladder, is an issue. There is a possibility I will end the semester with a kidney infection. She also dislikes it when we eat because most of the packaged foods (granola bars, chips, sandwich wrappers) students prefer are wrapped in a noisy materials like that hybrid aluminum cellophane. It is too noisy and disruptive. This is also a problem because I like eating. Especially in class. But her ears are quite sensitive, and she’s asked me twice now, to put my granola bar away (I forget because we only have class once a week, so it hasn’t been ingrained yet. My almost Pavlovian response to sitting down in class is to take out a granola bar). But I am working on being sensitive to that. She has an iphone, an unexpected gadget for a woman who put her phone number down on the syllabus. Her students, raised on email, instant and text messaging, looked at her curiously. I’m not saying the class is a disappointment. I didn’t sign up for a comedy show, after all, but nor did I sign up to hear my classmates expound on the novels we are reading. But that’s a seminar for you. The takeaway, I suppose, is the professor’s taste, revealed in her carefully curated reading list. I can’t quantify the monetary value of a good reading list because there is none, or if there is, it won’t become apparent until many years down the line, when I sell some ten thousand words for a few hundred dollars, (if I’m lucky), or recall it during a thoughtful afternoon lull, contemplating the profundity of the life I’m living and how near or far it is to/from the life I thought I would live, et cetera, et cetera. That sort of thing. It is, if I were to label generously, a foundation of sorts – a slow, cooking type of education that just happens to cost as much as an MBA. Apart from Ian McEwan, I did not recognize any of the other authors on the list. The subjects range from homeless people to farming to Lyndon Johnson to lesbianism (a graphic novel!). Each book represents a different approach/technique to plot development, something non-fiction writers struggle with because much of the time, we don’t know how things are going to unfold or end. Now, three weeks in, we’ve arrived at Evan S. Connell’s Mrs. Bridge, a novel about a lonely woman and her family, which despite its dull cover directed at prim, repressed women of a certain age, will probably be one of my favorites this year. Her first name was India – she was never able to get used to it. It seemed to her that her parents must have been thinking of someone else when they named her. Or were they hoping for another sort of daughter? As a child she was often on the point of inquiring, but time passed, and she never did. Now and then while she was growing up the idea came to her that she could get along very nicely without a husband, and, to the distress of her mother and father, this idea prevailed for a number of years after her education had been completed. But there came a summer evening and a young lawyer named Walter Bridge: very tall and dignified, red-haired, with a grimly determined, intelligent face, and rather stoop-shouldered so that even when he stood erect his coat hung lower in the front than in the back. 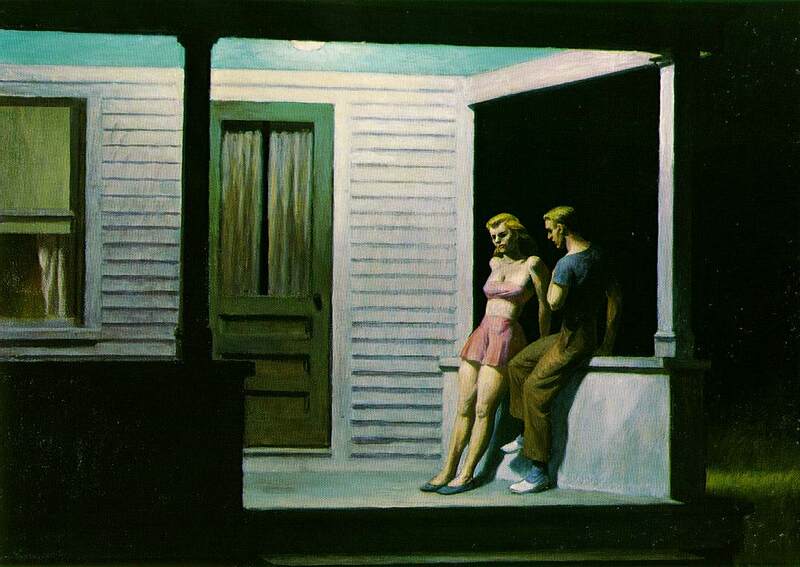 She had known him for several years without finding him remarkable in any way, but on this summer evening, on the front porch of her parents’ home, she toyed with a sprig of mint and looked at him attentively while pretending to listen to what he said. He was telling her that he intended to become rich and successful, and that one day he would take his wife -“whenever I finally decide to marry” he said, for he was not yet ready to commit himself – one day he would take his wife on a tour of Europe. A few months after her father died she married Walter Bridge and moved with him to Kansas City, where he had decided to establish a practice. All seemed well. The days passed, and the weeks, and the months, more swiftly than in childhood, and she felt no trepidation, except for certain moments in the depth of the night when, as she and her new husband lay drowsily clutching each other for reassurance, anticipating the dawn, the day, and another night which might prove them both immortal, Mrs. Bridge found herself wide awake. During this moments, resting in her husband’s arms, she would stare at the ceiling, or at his face, which sleep robbed of strength, with an uneasy expression, as though she saw or heard some intimation of the great years ahead. She was not certain what she wanted from life, or what to expect from it, for she had seen so little of it, but she was sure that in some way – because she willed it to be so – her wants and her expectations were the same. For a while after their marriage she was in such demand that it was not unpleasant when he fell asleep. Presently, however, he began sleeping all night, and it was when she awoke more frequently, and looked into the darkness, wondering about the nature of men, doubtful of the future, until at last there came a night when she shook her husband awake and spoke of her own desire. Affably he placed one of his long white arms around her waist; she turned to him then, contentedly, expectantly, and secure. However nothing else occurred, and in a few minutes he had gone back to sleep. This was the night Mrs. Bridge concluded that while marriage might be an equitable affair, love itself was not. I'm curious — what sorts of books make up the reading list for a non-fiction seminar?